By default, a Cisco router permits all IP and TCP traffic unless an access list is defined and applied to the appropriate interface. 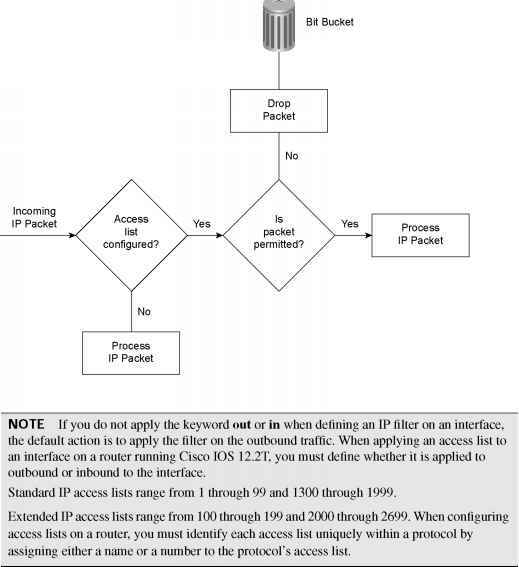 Figure 3-4 illustrates the steps taken if an access list is configured on a Cisco router. If an incoming IP packet is received on a router and no access list is defined, the packet is forwarded to the IP routing software. If an access list is defined and applied, the packet is checked against the access list, and the appropriate permit or deny action is taken. The default action taken by any access list is to permit any explicitly defined statements and explicitly deny everything else. You will not see the explicit deny statement when you issue the show ip access-lists command because that is the default behavior. Standard IP access lists filter on the source address only. A number from 1 through 99 that defines a standard access list number. Versions of Cisco IOS 12.0 or later also have standard access lists ranging from 1300 through 1999. Keyword that designates the access list as an outbound packet filter. This is the default action. For IOS images versions below 12.2T, the in or out keyword must be defined, there is no longer a default option. Suppose you have found a faulty NIC with the address 141.108.1.99/24. You have been asked to stop packets from being sent out Serial 0 on your router but to permit everyone else (access-list 1 permit any). In this situation, you need to deny the host address 141.108.1.99 and permit all other host devices. Example 3-32 displays the access list that fulfills this requirement. Next, you would apply the access list to filter outbound (the keyword out is supplied) IP packets on the Serial 0 interface. 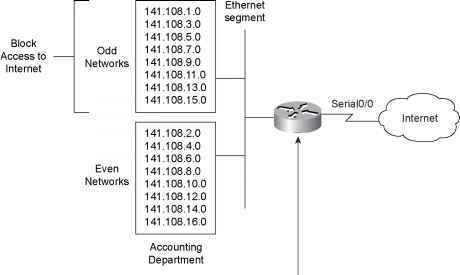 Example 3-33 applies the access list number 1 to the serial interface (outbound packets). You can be a little wiser and filter the incoming packets on the Ethernet interface. This ensures that the packet is immediately dropped before it is processed by the CPU for delivery over the serial interface. Both examples are displayed in Example 3-33. Now look at a more complex example of using a standard access list. Suppose you have 16 networks ranging from 141.108.1.0 to 141.108.16.0, as shown in Figure 3-5. You have assigned even subnets (2, 4, 6, 8, 10, 12, 14, and 16) to the Accounting department and odd subnets (1, 3, 5, 7, 9, 11, 13, and 15) to the Sales department. You do not want the Sales department to access the Internet, as shown in Figure 3-5. To solve this issue, you configure a standard access list. Figure 3-5 displays a simple requirement to block all odd networks from accessing the Internet. 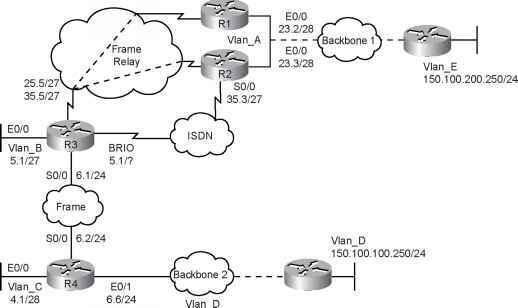 Instead, permit only even networks (2, 4, 6, and so forth) with one IOS configuration line. To accomplish this, convert all networks to binary to see if there is any pattern that you can use in the wildcard mask. Table 3-8 displays numbers 1 through 16 in both decimal and binary format. Notice that odd networks always end in the binary value of 1, and even networks end with 0. Therefore, you can apply your access lists to match on the even network and implicitly deny everything else. Even numbers will always end in binary 0. You do not care about the first 7 bits, but you must have the last bit set to 0. The wildcard mask that applies this condition is 111111110 (1 is don't care and 0 is must match; the first 7 bits are set to 1, and the last bit is set to 0). The preceding access list will match networks 2, 4, 6, 8, 10, 12, 14, and 16 in the third octet. The default action is to deny everything else, so only even networks will be allowed, and odd networks are blocked by default. Next, you would apply the access list to the inbound interface. Example 3-34 describes the full configuration. You can be a little wiser and filter the incoming packets on the Ethernet interface. This ensures that the packet is immediately dropped before it is processed by the CPU for delivery over the serial interface. This conserves critical CPU cycles.